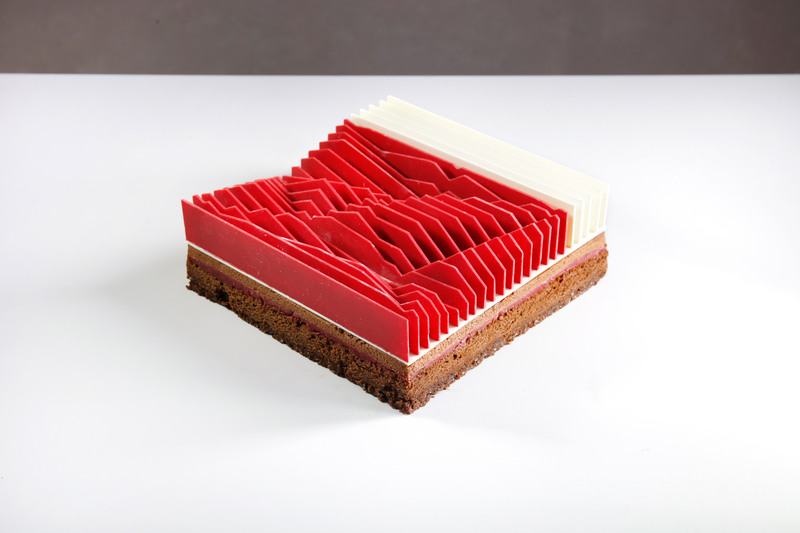 The multilayered, three-dimensional works of artist José Margulis have been transformed into tasty treats by architect-turned-patisserie chef Dinara Kasko. 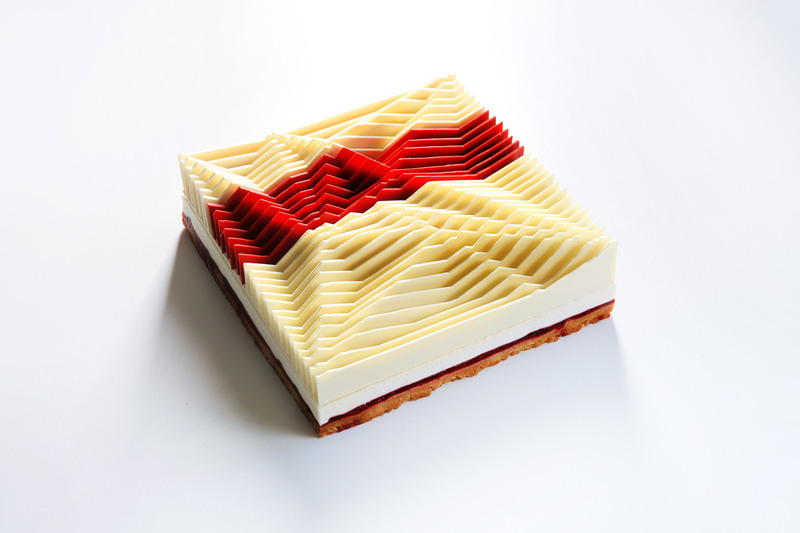 The Kinetic Tarts are the result of a collaboration between Kakso and Margulis, who worked together to create edible versions of his artworks for food publication So Good. 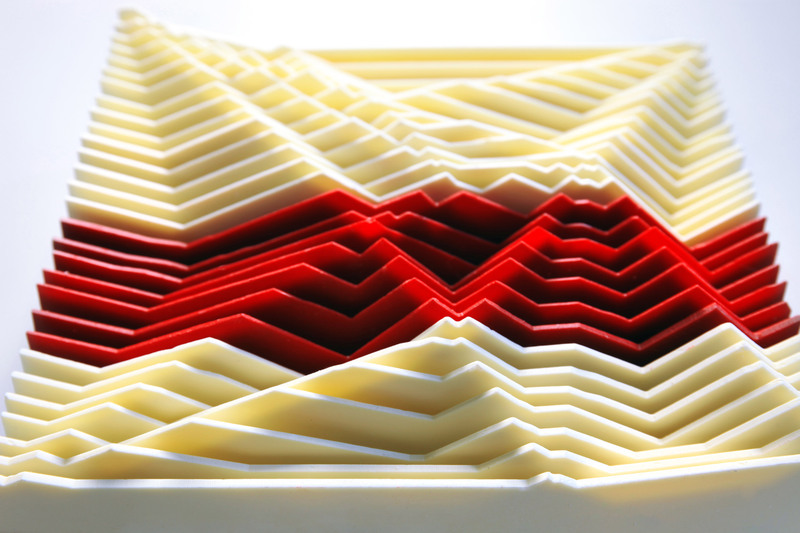 Margulis, a Miami-based mixed-media artist, forms his sculptures from layers of colourful plastic sheets – creating a geometric pattern that changes depending on the viewing angle. 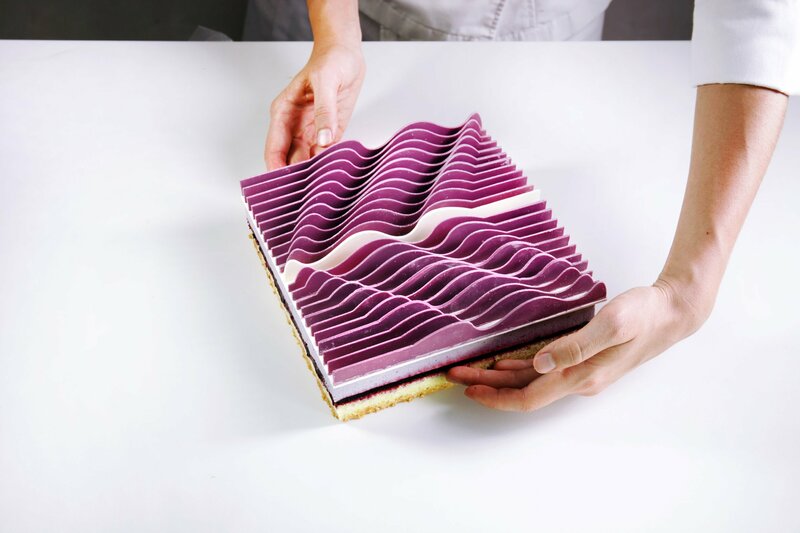 Kasko, keen to retain the qualities of Margulis' work, enlisted the artist to sketch different ideas, and worked from his drawings to create a series of edible sculptures. Industrial cutting machines were used to slice up the sheets of red and white chocolate, before each was assembled atop of a square-shaped berry tart. "I tried to transform his creations, made of plastic, aluminium and acrylic, into something edible, using basic techniques and ingredients," said Kasko. "Yet, I wanted to preserve his message and feel." "It had to be an installation-performance where the art was created by José Margulis and then transformed by me into an edible piece of art which would be later consumed – thus disappear," she continued. "I was transforming the object of art into something edible that would later perish, while emphasising the ephemeral art, its fleetingness in our life." Ukrainian-born Kasko began her career working as an architect and a 3D visualiser. Drawing from her past experience, Kasko's desserts all have architectural characteristics, which she often achieves by using silicone moulds modelled with Autodesk's 3ds Max software. Another one of her creations – named Cake Bubbles – is cocooned in a white chocolate bubble shell set in a silicone mould, while Geometric Desserts has a surface that looks like concrete. Food is becoming an increasingly explored area among designers. Royal College of Art student Kia Utzon-Frank designed a series of cakes disguised as polished stone, while Italian architect Salvatore Spataro created miniature chocolate versions of Sicilian farming tools and toys including baskets, fish traps and spinning tops.